Blinded and shackled to the columns of the Philistines' temple for public display and ridicule, the Israelite warrior Samson avenged himself by bringing the building down around him and on the heads of his tormentors (Judges 16:21–31). His previously shorn hair, the source of his extraordinary strength, had grown back, returning his power and allowing him to kill more Philistines in death than during his lifetime. Through this immense feat of physical strength, Samson singlehandedly delivered Israel from her enemies. This complex, chaotic composition was intended to be viewed from below, contributing to the sense of the downward movement of the figures tumbling through space. The artist based Samson’s muscular, twisting body on a fragmentary ancient sculpture, the Belvedere Torso, which was frequently referenced in the work of Renaissance artists, including Michelangelo. Private Collection (Switzerland), sold through Mario Modestini (New York, New York) to the J. Paul Getty Museum, 1992. Medici, Ulderigo. Catalogo della Galleria dei Principi Corsini in Firenze (Florence: Stabilimento Tipografico Mariani,1880), p. 91, no. 322. Bodart, Didier. "Pierre-Paul Rubens et la 'Vengeance de Samson': son oeuvre charnière inédite de la périod italienne." Artibus et historiae no. 26 (1992), pp. 15-30. Jaffé, Michael. 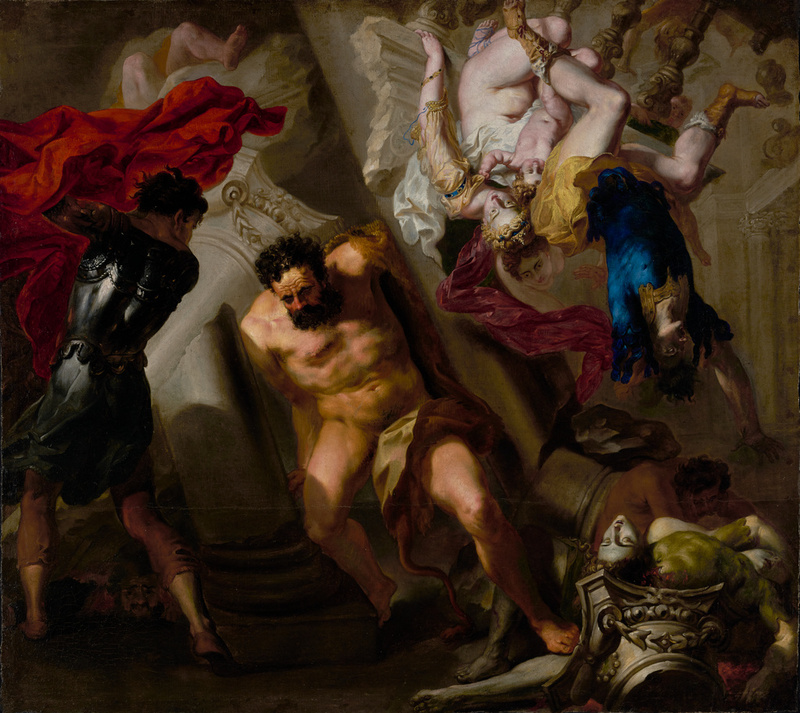 "Samson Destroying the Temple of Dagon: A Rediscovered Rubens." Apollo 139, no. 382 (December 1993), pp. 377-82. Jaffé, David. Summary Catalogue of European Paintings in the J. Paul Getty Museum (Los Angeles: J. Paul Getty Museum, 1997), p. 112, ill.
Jaffé, Michael. The Devonshire Collection of Northern European Drawings (Turin: Umberto Allemandi, 2002), p. 134, ill.
Cutrone, Cinzia. "Le Acquisitioni delle opere di pittura Europea del J. Paul Getty Museum, Los Angeles, CA US." B.A. thesis (Università degli Studi Roma Tre, 2003), pp. 76-77, 145-53, ill.